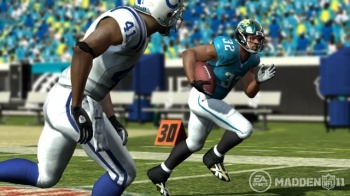 A source alleges that EA is making a movie about what the Madden curse is like behind closed doors. You might think that EA would want to squash any talk about the Madden curse, but an unnamed source within EA has revealed otherwise. The source told The Wrap that EA is actually creating a film based on the stigma that's been attached to its football franchise packaging for years. EA is reportedly developing a sports comedy called Madden Curse that focuses on a Madden video game champion that is forced out of retirement and placed on the corner of the Madden cover at the same time. Because he's on the cover, the Madden curse affects this sports gamer in hilarious ways we can only begin to imagine. I bet he'll stub his toe, or perhaps step on a rake that's been haphazardly left in the front yard. The Madden curse hasn't been proven scientifically, but it's come close. It primarily arose from the period between 2001-2006 when every player that was featured on the cover of Madden was either injured or ended up playing terribly. Dante Culpepper went from leading the Vikings to the playoffs in 2000 to appearing on the cover of Madden NFL 2002 and throwing 23 interceptions and breaking the record for single season fumbles. Michael Vick broke his leg after appearing on the cover of Madden NFL 2004. Shaun Alexander followed up his Madden NFL 2007 appearance with a major foot injury. From Madden NFL 2008 and onward, there hasn't been much more evidence to help prove the Madden curse, but that doesn't mean it wasn't real for half-a-decade, or that it won't come back someday. There's no word on how or where EA will display Madden Curse, but it sounds like a web series to me. Details are pretty slim right now, so it could be live-action, animated, stop-motion, or use shadow puppetry. Maybe the gamer involved in the movie will discover the truth behind the Madden curse, and destroy its evil football wizard creator once and for all.